Samsung just can’t catch a break this week when it comes to updates. First the Windows Phone 7 update mysteriously bricks a bunch of Samsung handsets, and Microsoft pretty much lays the blame on Samsung’s lap. Now they’re having issues with getting the Sprint Epic 4G updated to Froyo. 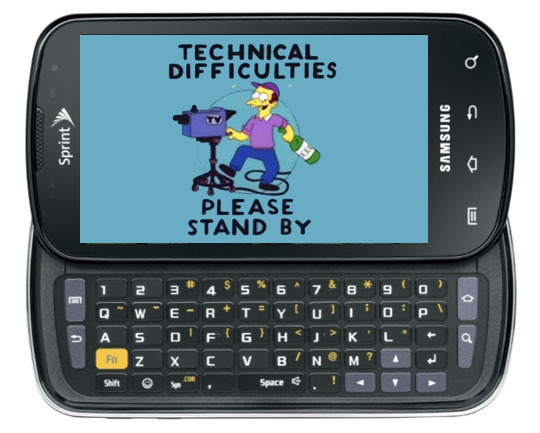 The word comes from Sprint’s support forum, where a company rep claims that an “increased number of calls into Care” has lead to the update being canned “until a resolution for these issues is in place”. The issues they’re speaking of all seem to focus around spotty data connectivity and SD Card accessibility issues. Either one would be a bummer — but they’re still a lot better than handset brickage. Having issues? Try giving your handset a hard reset (after backing up your stuff, of course.) While that’s never a welcome solution, it seems to fix the issue.